31 January 2011. The main innovations in Video Network Infrastructure products in 2010 were to extend the capability of the powerful MCUs launched in 2009 to enable: (a) the interconnection of multiple-screen Telepresence solutions of different vendors (Cisco, LifeSize, Polycom, RADVISION and Cisco/Tandberg systems); and (b) to enable connections to smart phones and tablet PCs. In January 2010, Cisco creates an open standard - the Telepresence Interoperability Protocol (TIP)- and offered to license it royalty free; LifeSize, TANDBERG and RADVISION signed up TANDBERG demonstrated Telepresence interoperability between TANDBERG Telepresence and the Cisco CTS 3000. In September 2010, the International Multimedia Telecommunications Consortium (IMTC) took over ownership of the Telepresence Interoperability Protocol (TIP) from Cisco Systems and established a TIP Activity Group and an open standard web site. The TIP (Version 6 and Version 7) specifications are available from IMTC. These protocol specifications describe how to multiplex multiple screens, multiple audio streams, and an auxiliary-data screen into respective Real-Time Transport Protocol (RTP) flows using a multiplexing technique. Available in October 2010, the RADVISION's SCOPIA Elite MCU with the new Telepresence Interoperability (TIP) feature of SCOPIA V7.5, provides connectivity to users with Telepresence systems from Cisco, Logitech/LifeSize, Polycom and Tandberg allowing them to view all meeting participants in a multi-party call, including those on traditional video conferencing systems. Connectivity to mobile phones, smart phones and tablet PCs was made available on the following platforms in 2010: Cisco TelePresence Video Communication Server, Compunetix EVERGREEN MCUs, Polycom Open Collaboration Network, RADVISION SCOPIA Elite MCU with Mobile V2 and Siemens OpenScape Unified Communications suite. There were two new MCUs released in 2010: The Compunetix, Inc. new line of video Multipoint Control Units (MCUs) known as the EVERGREEN family and the LifeSize Bridge 2200 - a new modular, 16-port MCU which scales intelligently. The RADVISION's SCOPIA Elite MCU was enhanced as described above. New appliances for video recording, streaming, content management and distribution in 2010 came from: LifeSize Video Center with the capability to instantly stream, record and auto-publish 720p/30; the Polycom video content platform based on the RSS 4000 and other appliances. New solutions for NAT and firewall traversal for businesses in 2010 came from: LifeSize Transit Server with LifeSize Transit Client - a complete NAT and firewall traversal solution for businesses based on Paradial technology; the new Video Firewall Traversal Server (FTS) solution from UK systems integrator VideoCentric. In March 2010, Tandberg launched its new Tandberg Advanced Media Gateway which transcodes Microsoft's RTV video format to H.264 HD video; this enables a video link between Microsoft Office Communicator 2007 R2 Users and standard-based H.264 video users. In April 2010. LifeSize Communications, a division of Logitech, launched LifeSize Video Center that gives organisations the capability to instantly stream, record and auto-publish video in 720p/30 HD video, audio and data content, with unparalleled simplicity at a reasonable cost. In October 2010, LifeSize's Video Center 1.1 software added new features such as integration into any LDAP server, enhanced reporting tools, and APIs to use with VBrick systems. In June 2010, Compunetix, Inc., announced its new EVERGREEN family of video Multipoint Control Units (MCUs) known as the Cedar, the Cypress, and the Sequoia. A new video client called STix (Soft Terminal by Compunetix) will compliment the new Compunetix MCUs. In July 2010, LifeSize announced LifeSize Virtual Link to enables data sharing live or on demand with the use of a PC or Mac. The LifeSize Desktop updated Version 2.0 software now supports data sharing as well as 720p HD video. In July 2010. Logitech International acquired the assets of Paradial AS, a Norway-based provider of firewall and NAT (network address translation) traversal solutions for video communication. Most of Paradial's employees, including founders, will be part of Logitech's LifeSize division. The acquisition allows Logitechand LifeSize to closely integrate firewall and NAT traversal across its video communication product portfolio. In July 2010, the new LifeSize Transit Server, which combined with LifeSize Transit Client, provides a complete network address translation (NAT) and firewall traversal solution for businesses, to ensure HD video calls can be made reliably both within and outside the organization. In July 2010, LifeSize Control, Version 5.0 video management software was released with new support for LifeSize Desktop and LifeSize Video Center, Google calendar and scheduling integration, and user-customizable administrator settings and directories. In July 2010. IPeak Networks will use new financing (1) to accelerate Internet Performance and Quality (IPQ) and VDI product development and (2) to ramp up the sales and marketing of its packet loss technology. In September 2010, VideoCentric launched its new Video Firewall Traversal Server (FTS) based on a dual port Linux engine with a public IP address for the internet side and a private one for the LAN/VPN side. Cost was under $2,000. In October 2010, LifeSize launched the LifeSize Bridge 2200 - a 16-port MCU based on a modular Full HD 1080p video architecture that enables organizations to take a building block approach, scaling video conferencing deployments as the demand for HD video conferencing grows. 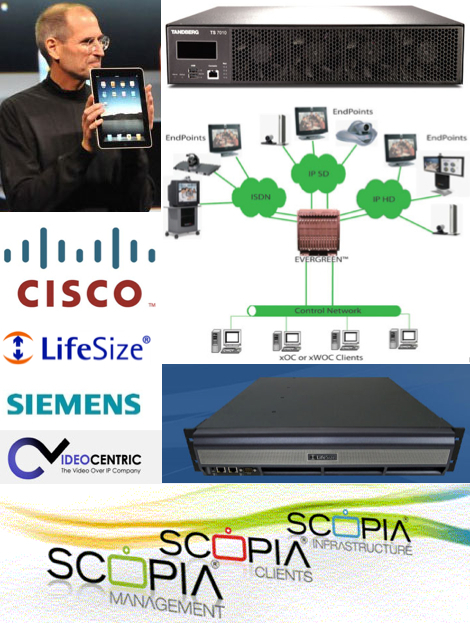 In October 2010, RADVISION SCOPIA Elite MCU with SCOPI v.7.5 was launched with enhancements to enable links between Cisco, Logitech/LifeSize, Polycom and TANDBERG Telepresence systems and with HD VC systems. In October 2010, Lifesize announced the new LifeSize Bridge 2200 - a modular, 16-port MCU which scales intelligently and makes Full 1080p HD video accessible for organizations using multiparty video communications. In December 2010, Siemens Enterprise Communications enhanced its OpenScape UC Server 2010-- a Unified Communications portfolio for the data center and virtualized environments released in March -- with a set of collaboration, mobility and video tools. In December 2010, RADVISION SCOPIA Elite MCU with Mobile V2 was launched. This enables H.239 data collaboration between Apple iPhone and iPad and standards-based HD videoconferencing and Telepresence systems. 1. Many vendors will be promoting their Unified Communications platform as a video network to connect any endpoint, located anywhere, over any network. 2. Most vendors will be enhancing their infrastructure solutions that smart phones and tablet PCs can become videoconferencing endpoints, the recipients of data sharing and the recipients video streamed broadcasts to hundreds of users for training, etc. 31 January 2011. In previous weeks we selected the 12 Best Telepresence Solutions of 2010 and the 16 Best High-Definition Videoconferencing Solutions of 2010. This week we select the 10 Best Video Network Infrastructure Solutions released or enhanced in 2010. To qualify for a 2010 Award, a Video Network Infrastructure solution had to be launched or substantially improved in Calendar 2010. The Editor takes the side of the user and looks for innovation, reliability, ease of use and price-performance in Infrastructure solutions. 6. LifeSize Transit Server with LifeSize Transit Client is a complete NAT and firewall traversal solution for businesses to ensure HD video calls can be made outside the organization. 31 January 2011. Cisco offers two MCU to handle Telepresence and videoconferencing endpoints: The Cisco TelePresence Server 7010 and the Cisco TelePresence Server MSE 8710. We have chosen the Cisco TelePresence Server 7010 because it is the entry level size and includes Telepresence Interoperability Protocol (TIP) version 7 released in 2010. The Cisco TelePresence Server 7010 brings together participants Telepresence endpoints and those with High-Definition (HD), Standard-Definition (SD) videoconferencing systems within the same video meeting. To facilitate the best possible user experience, the server intelligently recognizes system types. You can connect to up to nine screens or upgrade the system to support 16 screens. Increase the large-scale Telepresence experience with a full-screen, immersive view of the primary speakers and an overlay of the other participants. - Supports OneTable and Room-Switched configurations. 31 January 2011. The Cisco TelePresence Video Communication Server supports highly scalable deployments that are needed as organizations adopt Telepresence for desktops and enable mobile workers with video. The solution includes tools for large-scale installations and video network management, making deployment and management easier and cost-efficient. VCS enables any-to-any interoperability between all standards-compliant SIP and H.323 devices. It can be used to connect with Customers, Suppliers, and Partners. It can also be used to simplify the large-scale deployment of video. The X6 version of the software was released in December 2010. VCS creates a community of users by makes that community possible with a seamless, scalable solution that extends the benefits of video conferencing and telepresence to other communications environments including unified communications and IP Telephony networks. As more organizations adopt personal video systems, VCS is built to support highly scalable deployments. VCS offers users of "personal" video the features they demand, such as FindMe and Multiway. VCS enables video communications devices to interoperate with unified communications and Voice over IP solutions, providing the end user the best experience possible no matter what device they are using to communicate. VCS supports the network administrator by providing large-scale installation and management tools that make deploying and managing the video network easier. Cisco TelePresence Video Communication Server Expressway facilitates business-to-business (B2B) Telepresence and video communications outside the firewall. It transparently connects businesses and other organizations reliably and with high security. 31 January 2011. Cisco announced its Cisco Telepresence Exchange System software - a Telepresence service-creation platform that can be used to offer cloud-based managed and hosted Cisco TelePresence and business video services In November 2010. This integrated solution supports new and expanded options for Telepresence service, which can help you to accelerate the growth of telepresence communities on your network. It will help expand the global network for Telepresence meetings. The software can also used to introduce a range of basic and advanced media services for Telepresence, including: Highly secure intercompany calls, Multimedia conferencing and Interoperability. 31 January 2011. When the telephone became the important means of communication for a community it required a telephone directory with telephone numbers and address. Telepresence has now reached that stage. The Cisco TelePresence Directory helps users easily find the information needed to quickly arrange and schedule intercompany meetings at public and private Telepresence locations around the world in a simple and secure way. A growing number of organizations, telepresence rooms, video communities, and user groups are accessible through intercompany Cisco TelePresence architecture and exchanges. With Cisco TelePresence Directory, you can help users find information and scheduling tips to quickly arrange intercompany meetings for public and private locations. You can crease Telepresence collaboration by linking to a growing community of partners, suppliers, and potential customers. You can still maintain the privacy of your telepresence resources with flexible policy controls. 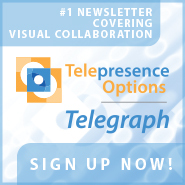 t establishes closed user groups to further promote video communities with more information regarding telepresence resources. Cisco TelePresence Directory also helps you to quickly find Cisco TelePresence rooms and locations to accommodate an expanding collaboration team. 31 January 2011. Compunetix, Inc., has announced a new line of video Multipoint Control Units (MCUs) known as the EVERGREEN family in June 2010 and showcased them at the InfoComm 2010 trade show. The EVERGREEN family of MCUs marked the reemergence of Compunetix into the videoconferencing collaboration market. Initially, this family will be based on three platforms, the Cedar (7-15 ports), the Cypress (7-45 ports), and the Sequoia (15-90 ports) and will address the needs of the diverse videoconferencing industry, from enterprise users to Conferencing Services Providers (CSPs) and government agencies. Compunetix EVERGREEN achieves its performance as an MCU through advanced digital signal processing (DSP) technology, a richly interconnected, high bandwidth internal switch fabric and a unique set of link ports that allow multiple MCUs to be interconnected without cascading. Built on a multiply redundant platform, EVERGREEN offers a carrier class product at an extremely attractive price. The EVERGREEN family of MCUs embodies the engineering and marketing knowledge base of the entire Compunetix organization. This product family leverages the video experience of the Video Systems Division (VSD) and adds to it the broad knowledge of commercial collaboration platforms of the Communications Systems Division (CSD), along with the reliability, redundancy and security features built into the products of their Federal Systems Division (FSD). The EVERGREEN family has been architected in anticipation of an explosion of video enabled products from hand-held wireless devices, to desktop systems, room video systems, all the way to executive Telepresence suites. The COMPUNETIX Cedar, Cypress, and Sequoia systems are based on the Advanced Telecommunications Computing Architecture (ATCA)/Advanced Mezzanine Card (AMC) architecture to provide redundant power, control, clock distribution and shelf management. The EVERGREEN architecture extends and enhances these strengths through the innovative ATCA and AMC blades Compunetix has designed for the system. These blades create a high bandwidth, richly interconnected internal switch fabric for investment protection on this platform for years to come. The AMC modular design allows for hardware upgrades to occur as processing technology evolves without "forklift" upgrades. 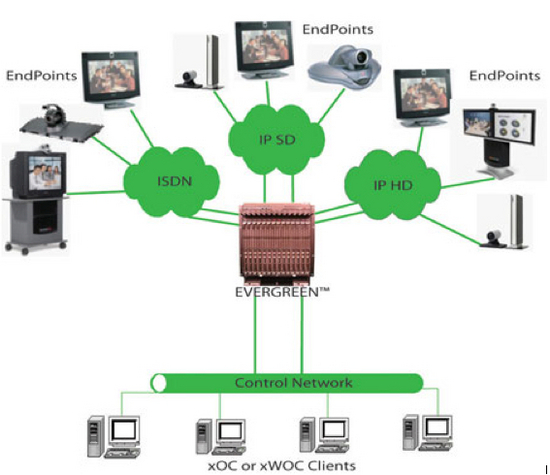 The EVERGREEN products also support ATCA Rear Transition Modules (RTMs) that provide physical interfaces to a variety of different networks. This modular architecture allows the system to support multifunctional capability in the same system without the need for separate gateway, storage, or playback devices. The EVERGREEN product family is truly a massively scalable platform. There is a single multipurpose ATCA "carrier card" that is used in each card slot location. The functionality of this card is controlled by the software applications activated on it and enhanced by the processing power of the AMC blades inserted in it and the system RTM interfaces. Port capacity can be cost efficiently added to the system by adding the appropriate number of AMC blades. System software optimizes the use of the available processing capacity so that a greater number of ports can be supported when operating at lower resolutions rather than wasting valuable resources like other products on the market. As port capacity needs grow, the ATCA/AMC blades can be migrated to a larger model or multiple systems can be interconnected via our dedicated and unique inter-chassis links to create a single larger system without the headaches of port cascading and management. Compunetix also announced a new video client application called STix (Soft Terminal by Compunetix). STix is a stand-alone H.323 compliant video application for the desktop. Available initially on Microsoft Windows-based platforms, STix is intended to enable anyone with a PC to participate in a video conference from their workspace without the need to schedule the resources of a room system. Dr. Giorgio Coraluppi, Compunetix President and CEO, commented "Videoconferencing is becoming pervasive in business and in the consumer market. With EVERGREEN, we are poised to support the infrastructure required to meet today and tomorrow's demand." Compunetix is recognized as a leading manufacturer of multipoint collaboration equipment and is best known for its audio conferencing equipment and Web collaboration software. With over 500,000 ports installed in more than 28 countries, the company has the industry's largest worldwide deployment of digital conferencing systems. 31 January 2011. Lifesize Communications, a Division of Logitech, announced the availability of the new LifeSize Transit Server for September 2010. With the advent of IP communications, connecting to customers, suppliers, partners and colleagues around the globe became easier and more cost effective. But conducting video calls by passing through a network firewall meant opening and closing communication ports, leaving networks vulnerable to possible attacks. LifeSize Transit Server and Client over comes this vulnerability. 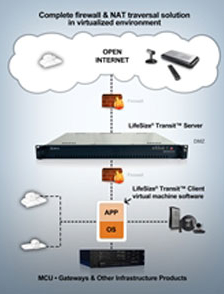 LifeSize Transit creates a secure path through a firewall without compromising IP security. It is a complete firewall and NAT traversal solution that enables people to make video calls within and across enterprises and organizations by securely traversing firewalls. With standards-based H.460 and SIP tunneling, the result is secure, simple to use video communications. The LifeSize Transit Server is scalable and supports up to 20 simultaneous Full HD 1080p calls up to 1.7Mbps. Clustering support is available to both increase capacity and increase system resiliency. The LifeSize Transit Server also provides signaling, media, registrar and gatekeeper services in a single appliance, handling up to 500 device registrations. All LifeSize videoconferencing systems include both H.460 and SIP firewall traversal software at no additional licensing fee, enabling the LifeSize Transit solution out of the box and making LifeSize video communications systems ready for firewall/NAT traversal support. With LifeSize Transit, you can experience better communications without compromising on security. LifeSize offers an enterprise-class firewall / NAT traversal solution that is simple to set up and manage. It will appear to be seamless to endusers. The complete LifeSize Transit solution is composed of the Server and Client appliances, and the Client virtual machine software. 31 January 2011. Lifesize Communications, a Division of Logitech, announced the availability of the new LifeSize Transit Client for September 2010. As described above, LifeSize Transit Server and Client over comes the vulnerability of IP networks to security breaches. The new LifeSize Transit Client, combined with LifeSize Transit Server, provides a complete state-of-the-art network address translation (NAT) and firewall traversal solution for businesses, to ensure HD video calls can be made reliably both within and outside the organization. The unique LifeSizeTransit Client is the only solution in the market allowing enterprises to deploy a firewall/NAT traversal solution virtually in their existing server farms without the need to provision extra equipment. The unique LifeSizeTransit Client is available as either a hardware appliance or a virtual machine option. It is based on technology from Norway's Paradial that Logitech acquired in June 2010. The LifeSize Transit Client appliance helps preserve network topology allowing all endpoints and network infrastructure devices to be within the private network. Working as a proxy for the LifeSize Transit Server, and residing inside the LAN, it renders Firewall/NAT traversal services to all video conferencing devices, including legacy endpoints. LifeSize Transit Client virtual machine is a virtual appliance that can be deployed in a virtualization infrastructure to work along with LifeSize Transit Server appliance. Organizations with existing VMWare server environments will save space, streamline operation, and increase utilization by deploying the virtual machine software option of Transit Client. 31 January 2011. LifeSize Communications, a division of Logitech, launched LifeSize Video Center, an innovative video capture and broadcast system that enables High-Definition video to be accessible everywhere - live or on demand. With LifeSize Video Center, organizations now have the capability to instantly stream, record and auto-publish video in 720p/30 HD video, audio and data content, with unparalleled simplicity and at reduced cost. The LifeSize Video Center appliance is specifically designed to process HD video directly where it is created, harnessing the power of LifeSize 220 series HD video communications systems. The architecture is the industry's first solution to enable an unprecedented 20 concurrent recordings in HD, 1000 simultaneous live streams and up to 350 simultaneous on-demand streams, all in crisp, 720p30 HD video. - to broadcast and record training or education classes at the press of a button and bring faculty to remote students, without compromises in quality. LifeSize's Video Center 1.1 software launched in September 2010 offered new features and capabilities that include integration into any LDAP server, enhanced reporting tools, and APIs to use with VBrick systems. The latest software allows administrators to seamlessly integrate LifeSize Video Center into any Lightweight Directory Access Protocol (LDAP) server, including Active Directory. A one-time configuration for the entire organization gives IT teams more centralized, simplified management for both individual users and groups. The Version 1.1 software also gives IT administrators access to rich, built-in reports to track video viewing statistics, allowing administrators to understand user behavior, system usage and ROI. One user, Quincy Newspapers, Inc., said that this product is going to change the way we deliver executive communications and corporate training to our remote offices. Another user, Gateway Technical College, said that the LifeSize Video Center will expand our instructional toolbox and enable us to reach our students wherever they are and on their own schedules. It's all about flexible learning options and this product really delivers. 31 January 2011. LifeSize Communications, a division of Logitech, launched the LifeSize Bridge 2200, a new modular, scalable MCU at the end of October 2010. The new bridge or multipoint control unit (MCU) allows IT administrators to take advantage of existing network architectures and put the bridge anywhere they have extra capacity, minimizing the need to make large bandwidth or other network infrastructure investments to fit their video conferencing needs. LifeSize Bridge 2200 is a 16-port MCU based on a modular Full HD 1080p video architecture that enables organizations to take a building block approach, scaling video conferencing deployments as the demand for HD video conferencing grow. - A flexible, modularMCU that deploys easily and scales across existing resources, geographies, and standards-based video conferencing offerings. The LifeSize Bridge 2200 makes both scheduled and on demand conferencing simple for IT administrators and end users. - The LifeSize Bridge symmetric approach to both 720p/60 and 1080p/30 receives a high-quality video stream in and transmits the same high-quality resolution without distortion. LifeSize Bridge supports more than 200 resolutions and also features sustained frame rates, a customized screen layout per participant, and up to 4 Mbps throughput. LifeSize Bridge offers flat capacity pricing for 16 ports at approximately $4,000 per port regardless of the resolution--720p/30, 720p/60 or 1080p/30. LifeSize claims the price per port is the lowest in the market and at 720p/60 and 1080p/30 HD video quality, the LifeSize Bridge is less than one-third the cost of other bridges in the market. More than 70 percent of all videoconferencing infrastructure spending is on bridges, so this introduction is important. The new LifeSize Bridge makes a distributed approach to video networks more practical and achievable for all types of organizations who must do more with less without sacrificing quality. 31 January 2010. Polycom combined real-time visual communication, live and on-demand video streaming, digital signage and network-efficient video content distribution in one package in March 2010. The aim is to help organizations tackle the inherent communication and collaboration challenges of managing a distributed and mobile workforce and operating globally. This Polycom solution combined with Polycom's market-leading Telepresence, video conferencing and desktop video collaboration solutions to give customers all the capabilities needed to video-enable their organizations. The Polycom solution also supports complementary products and systems from Polycom ARENA ecosystem partners and other vendors, including video encoders, content providers, content delivery systems and networks, wide area network (WAN) optimization systems, and other standards-based telepresence and video conferencing systems. This Polycom solution allows customers to enhance unified communication (UC) networks from Polycom Open Collaboration Network partners to support critical enterprise collaboration needs, such as: - corporate communication, training, distance learning, project communications, customer events, and sales and marketing communications. The flexibility of the new Polycom solution has benefits for organizations across industries, including multi-national enterprises, educational institutions and local, state and federal government agencies. The new Polycom solution integrates with Microsoft SharePoint, enabling users to cost-effectively create and import video content and leverage within their familiar workgroup application. 31 January 2011. Polycom's expanded relationship with Microsoft Corp. led to delivery in March 2010 and availability in Q2 2010 of an extended portfolio of Unified Communications (UC) solutions that will enable more effective collaboration for Microsoft and Polycom customers. - The Polycom CX3000 conference phoneoptimized for Microsoft Communicator "14"
The new Polycom CX series phones enhanced Polycom's broad portfolio of solutions for Microsoft environments that also include immersive Telepresence and video conferencing integration. Recent Polycom Telepresence and video conferencing developments include the following. The Polycom Conferencing for Microsoft Outlook solution for Microsoft Exchange Server and Microsoft Outlook dramatically simplifies how users schedule and join video meetings with Polycom HDX videooconferencing room systems by putting Polycom visual communication into the normal Outlook workflow. The Polycom Microsoft SharePoint Server Solution. Video-enabled SharePoint Server sites make it easy for users to publish, manage and view video media content securely. They offer the capabilities of the Polycom Video Media Center (VMC) 1000 within the SharePoint Server site. Users can leverage Polycom video endpoints to easily and cost-effectively create their own high-quality video content that can be automatically uploaded to the Polycom VMC 1000. Polycom continues to deliver on the Polycom Open Collaboration Network strategy by bringing to market the industry's broadest solutions portfolio that integrates with the market-leading UC solutions," said Jim Kruger, Polycom vice president Solution Product Marketing. 31 January 2011. RADVISION announced in March 2010 for Q3 2010 the SCOPIA V7.5 delivering extensive enhancements to RADVISION's video conferencing endpoint and infrastructure solutions including its SCOPIA Elite MCU, SCOPIA Desktop and iVIEW SCOPIA Management Suite. RADVISION demonstrated the new SCOPIA V7.5 solution at IP Convergence 2010 in Paris in October 2010. With the SCOPIA V7.5 enhancements, RADVISION SCOPIA Elite MCU provides connectivity to users with Telepresence systems from Cisco, Logitech/LifeSize, Polycom and Tandberg allowing them to view all meeting participants in a multi-party call, including those on traditional video conferencing systems and Telepresence systems from other vendors. Users participating with traditional video conferencing systems will see Telepresence participants in a special video layout where multiple video streams are combined into a single panoramic image. RADVISION SCOPIA Elite's new breakthrough Telepresence interoperability technology means that users of Telepresence are no longer an island connecting only to the same vendor's Telepresence; they can now be part of the broader videoconferencing community. SCOPIA V7.5 also delivers the first H.239 room system interoperable data collaboration that includes extended capabilities. SCOPIA Desktop's H.239 advanced data collaboration provides the ability to review previously shared data. Conference participants can now review information and catch up if they arrived late to a meeting or want to spend additional time on critical points in material already presented. With the SCOPIA V7.5 enhancement, RADVISION continues to expand its comprehensive support for unified communications with full integration for IBM Lotus Sametime. Sametime users will be able to enjoy the High Definition multi-party videoconferencing and connectivity capabilities of the SCOPIA solution with the native Sametime client with no additional installation required. Connectivity to Telepresence, video conferencing room and desktop systems, along with mobile and standard phones is now available directly through Sametime. Many video conferencing deployments have a variety of endpoints from different vendors. This presents a significant challenge to administrators in managing their address books and updating them. With RADVISION iVIEW SCOPIA Management Suite, administrators can update the address books for all their video conferencing systems with a single entry from either Microsoft Active Directory or IBM Lotus Domino. This capability is supported for the most popular endpoints available from RADVISION, Logitech/LifeSize, Polycom, Sony and Tandberg. RADVISION's current implementation of H.264 SVC already provided a very high degree of error resiliency. SCOPIA V7.5 has added additional capabilities to further improve performance over Internet connections. NetSense adapts the bandwidth used to a lower rate before packet loss actually affects call quality through a sophisticated prediction technique. In the event that errors do occur, potentially affecting call quality, SCOPIA V7.5 implements superior error handling through sophisticated Reed-Solomon error correction. When network conditions improve, NetSense restores the call to the original bandwidth utilized. The sum of these capabilities is engineered to provide the best quality experience possible. SCOPIA V7.5 reflects RADVISION's ongoing drive to deliver the easiest-to-use solutions, providing the highest quality experience at the most affordable prices in the market. RADVISION SCOPIA Mobile V2 is available for free through the Apple App Store. Two different versions of SCOPIA Mobile are offered. RADVISION SCOPIA Mobile V2 for the iPad is optimized for the large, high resolution display of the iPad; while SCOPIA Mobile V2 for the iPhone optimized for the high resolution Retina display and the additional telephony capabilities of the iPhone. SCOPIA Mobile V2 users can now view presentations, spreadsheets, documents and images shared in a video conference or Telepresence meeting with H.239 interoperable data collaboration. - View presentations, spreadsheets, documents and images shared in a video conference with H.239 interoperable data collaboration. Participants can also immediately review previously shared materials if they arrived late for the meeting without disturbing the meeting flow. - Easily connect to a conference and participate by audio with the iPhone or be called back on an alternate number. - Access your company directory to invite any attendee. You can also invite guest phones or video conferencing systems by their number or address. - You can mute noisy participants, stop the camera of a remote attendee or simply disconnect unwanted participants. - Change the video layout for any video conferencing system and even rearrange the participants in the layout. - Useful ways to control Meetings - Start or pause recording, start or stop streaming, lock a conference, extend the meeting time, and terminate individual participants or the entire meeting. - For troubleshooting, you can view participant statistics such as audio and video codecs in use, resolution, network speed and loss to assist in basic troubleshooting. In addition, iPhone users can easily connect to a video conference and participate by audio through the telephony capabilities of the iPhone. RADVISION SCOPIA Mobile V2's new data collaboration capabilities are based on RADVISION's recently introduced SCOPIA V7.5 solution for the SCOPIA Elite MCU (See previous Award). This new advanced data collaboration provides users with extended capabilities beyond what the H.239 standard offers, along with video conferencing room and Telepresence system interoperability. RADVISION SCOPIA Mobile V2 is another example of RADVISION's innovative leadership in creating the first broadly-based wya of including data sharing in a videoconference on smart phones and tablet PCs. 31 January 2011. Siemens Enterprise Communications announced in December 2010 a set of collaboration, mobility and video tools to enhance its OpenScape Unified Communications portfolio for the data center and virtualized environments released in March 2010. They build on its OpenScape UC Server 2010 launched in March 2010. 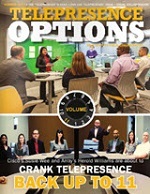 The enhanced solution known as OpenScape UC Suite 2011 includes an enterprise-grade Web conferencing solution called OpenScape Web Collaboration, a system for delivering packaged and custom applications to OpenStage phones called OpenScape PhoneApps, videoconferencing enhancements called OpenScape Video and an expanded range of mobile collaboration clients called OpenScape Mobility. OpenScape UC Suite 2011 includes changes to OpenScape Video that brings interoperability with video equipment made by Polycom, Tandberg and Lifesize. The upgraded video platform also includes support for H.264 High-Definition video in the OpenScape desktop client. OpenScape Web Collaboration, the stand-alone server distributes client agents to parties that are invited to join conferences. These agents either run in browsers or as executables on the client machines, but in either case they dissolve when the collaboration session ends. The collaboration software supports audio, video and chat and can include clients that run on iPhones, iPads and iPod Touches. Each conference can support up to 1,000 participants, and sessions are encrypted using AES 256-bit encryption, Siemens says. No other Siemens products are needed in order for Web Collaboration to work, but it has more features if it runs in combination with its OpenScape Unified Communications platform. Also new is OpenScape Phone Apps, a set of 20 applications supported through OpenScape UC Application server and provides conferencing capabilities and controls to Siemens IP phones. . Phone Apps also comes with a software developers' kit to customise the applications or to write new ones. Siemens has made OpenScape software easy to deploy and is setting an attractive price point for the innovative OpenScape solution. 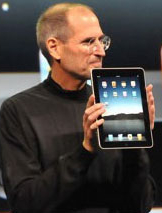 It has anticipated the need to connect to smart phones and tablets in the new OpenScape 2011 platform. 31 January 2011. VideoCentric launched its new Video Firewall Traversal Server (FTS) solution in September 2010. It is based on a dual port Linux engine with a public IP address for the internet side and a private one for the LAN/VPN side. VideoCentric Video Firewall Traversal Server circumvents the NAT issues by operating dual gatekeepers - one on the inside of the firewall handling local IP addresses and private registrations, and one on the public internet side handling public addresses, external registrations and DNS. The VideoCentric Video Firewall Traversal Server allows private IP users the ability to make internal calls on their own network as well as to securely make and receive external video calls to and from Internet users without the need to open or close ports or to reconfigure endpoints between private and public networks. Using the VideoCentric FTS, incoming Internet callers can simply dial by name such as [email protected] to securely route through to a desktop Videoconferencing system, rather than having to remember awkward IP addresses. This simplification of dialling is achieved by associating the VideoCentric FTS with an internet domain name server (DNS). Alternatively LAN/VPN users can dial by short code ... for example 6789 ... as translation between dialled digits and IP address is performed automatically by E.164 translation performed by VideoCentric FTS's embedded Gatekeepers. The Video Firewall Traversal Server shipped from 1 September 2010 with pricing starts at just £1,999 for a dual port server. VideoCentric is a leading UK-based systems integrator and reseller of H.323 and SIP video conferencing and MPEG streaming solutions from Cisco (including Tandberg and Codian), RADVISION, Polycom, Emblaze-VCON, Lifesize and Exterity. Headquartered in Wokingham near London, VideoCentric's 1080P internet demonstration facilities extend through to its office in Edinburgh, Scotland and experienced staff in Bristol to cover South West England and Wales. VideoCentric Video Firewall Traversal Server (FTS) is an innovative and inexpensive solution. It starts at undr £2000. In September 2010, VideoCentric launched its new Video Firewall Traversal Server (FTS) based on a dual port Linux engine with a public IP address for the internet side and a private one for the LAN/VPN side. Cost was under \$2,000. As more organizations adopt personal video systems, VCS is built to support highly scalable deployments. VCS offers users of \"personal\" video the features they demand, such as FindMe and Multiway. The AMC modular design allows for hardware upgrades to occur as processing technology evolves without \"forklift\" upgrades. The EVERGREEN products also support ATCA Rear Transition Modules (RTMs) that provide physical interfaces to a variety of different networks. This modular architecture allows the system to support multifunctional capability in the same system without the need for separate gateway, storage, or playback devices. The EVERGREEN product family is truly a massively scalable platform. There is a single multipurpose ATCA \"carrier card\" that is used in each card slot location. The functionality of this card is controlled by the software applications activated on it and enhanced by the processing power of the AMC blades inserted in it and the system RTM interfaces. Port capacity can be cost efficiently added to the system by adding the appropriate number of AMC blades. Dr. Giorgio Coraluppi, Compunetix President and CEO, commented \"Videoconferencing is becoming pervasive in business and in the consumer market. With EVERGREEN, we are poised to support the infrastructure required to meet today and tomorrow's demand.\"
LifeSize Bridge offers flat capacity pricing for 16 ports at approximately \$4,000 per port regardless of the resolution--720p/30, 720p/60 or 1080p/30. - The Polycom CX3000 conference phoneoptimized for Microsoft Communicator \"14\"
Polycom continues to deliver on the Polycom Open Collaboration Network strategy by bringing to market the industry's broadest solutions portfolio that integrates with the market-leading UC solutions,\" said Jim Kruger, Polycom vice president Solution Product Marketing.